An injection tester is normally used to check the operation and condition of primary and secondary equipment on the power systems. 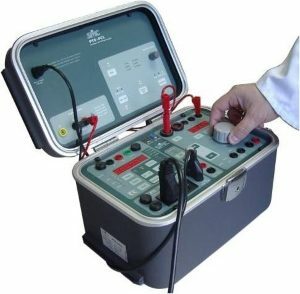 For this purpose, the injection tester simulates normal and fault signals which are used to test the specific equipment under a wide range of system conditions. These involves that the injection tester be capable of producing and control the suitable output levels that correspond to the voltage and/or current levels inputs of the device under test (DUT), with the suitable phase angle and frequency, including the simulation of power system faults. The injection tester can include also the capacity to capture and measure specific responses of the DUT to the specific simulation (eg. trip signals and trip values, trip times, logical sequences, turn ratio, etc) to be able to assess its condition, characterizing the behavior of the DUT to the expected measured magnitude and verify its proper and expected performance. In this way, depending on the type of test, and on the signal level and the type of response measured, there are different and specific injection testers, which for easier choice we can classify in two main groups, primary injection tester and secondary injection tester. Likewise, the user may choose between a specialized injection tester or a multi-purpose injection tester, according to their needs. The most typical primary injection tester is the high current injection equipment, for testing the complete loop of the protection scheme, general primary testing of main primary assets like transformers, breakers, motors, switchgear, etc, and overcurrent protection testing from primary side. Our traditional variac-based LET range of injection testers are perfectly adequate to all primary applications, with various models from 1 KVA to 8 KVA, with simple, robust construction, compact size, and ease of use, for up to more than 20,000 A depending of the selected model. 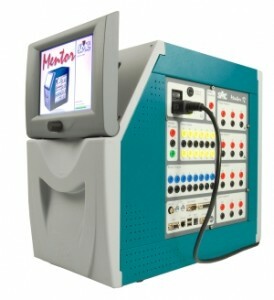 The other SMC option is the Raptor System, a multifunctional primary injection tester, the smallest and lightest on the market, with modern high-tech design that enables the highest level of injection capability in terms of power and duty cycle, with an ease of use so far never seen before in this type of equipment. Generally speaking, the traditional selection of a primary current injection tester has been made attending to the current range and compliance voltage, or power, characteristics. But this way of specifying does not make clear whether the voltage is on load or open circuit, or how far is the device under test, leaving to the user the duty of making calculations to be sure if the injection tester will be able to do his particular test or not. Fortunately, our Raptor System has overcome this whole problematic. Thanks to the use of the reliable Raptor Current Calculator, it is simple to define the suitable Raptor configuration and number and type of cables required as minimum to successfully accomplish a specific high current job, taking also in consideration the impedance of the DUT. The Raptor Current Calculator is included as standard in the Raptor HH control unit, but can also be installed on any PC. The modularity and revolutionary design of the Raptor system make the rest; the user is not limited in his initial power choice, and it is possible to increase the power of the system, when required, adding current slave units, which is performed in a very simple and quick way, thanks to the self-detecting infrared technology and the no need to interconnect the units. Up to three slaves can be added for up to 15,000 A with a 18-kVA total injection power. 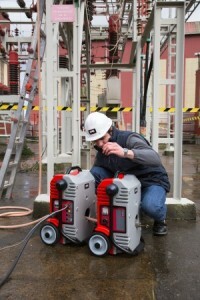 The Raptor HV, the high voltage slave, is an optional product that extends the Raptor’s applications to tests that require the use of up to 2000 V, providing a world-wide unique injection tester, which combines both high current and high voltage injection, with the suitable power, for the main maintenance and commissioning test applications in substations and switchgear. The Raptor is an innovative and advanced substation injection tester that replaces the need for multiple test sets. The first to consider when selecting an injection tester for secondary applications is whether the application requires a single phase injection tester or a three-phase. SMC offers the following single phase injection testers: PTE-100-C series, PTE-100-V, PTE-50-CE, UNO. The PTE-100-C series are variac-based, with high injection power for all kind of applications, while the units of the PTE range are digital injection testers, with higher accuracy and more stable output. Besides the different output ranges when choosing the injection tester, we must also keep in mind whether the application is mainly a current or voltage application, or requires current/voltage or two voltages, or two currents, simultaneously, that will result in selecting one or another model, or a combination of units, since they can also be interconnected between them and even with other brands. If required a 3-phase injection tester, the selection is among the models PTE-50-CET, PTE-300-V, TRES and the different MENTOR 12 configurations. The PTE-50-CET is mainly focused in current applications, with 3 current outputs, while the PTE-300-V is mainly focused in voltage applications with 3 voltages; both have reversible channels, so that both can be used for current and/or voltage applications as well. When used together, the combination is called TRES, a complete 3-phase system, with 3 currents and 3 voltages (but also 6 currents, or 6 voltages, or any combination in between). The MENTOR 12 is a modular system that provides many possible configurations from the typical 3V3I up to the maximum 6V6I (two complete 3-phase systems in one set). This modularity, with the capacity to be upgraded at any time, and its associated lower maintenance cost, should also be considered when selecting a 3-phase injection tester. In addition to the different number, type and range of output channels, we must also consider the wide integrated test tools in the MENTOR, which does not require the use of external PC, and the comfortable and friendly use of the big sized touch screen to control and monitor the entire test process. The automation software, ROOTS, is optional (both in Mentor and TRES), and it is also supplied in different licensed modules (overcurrent, distance, differential, voltage/frequency, etc). All equipment comes along with a full range of accessories for every need. As usual with SMC test equipment, simplicity and ease-of-use are common to any injection tester, equipments adapted to the user and the application.